Snake Bridge, near Sanostee, New Mexico. 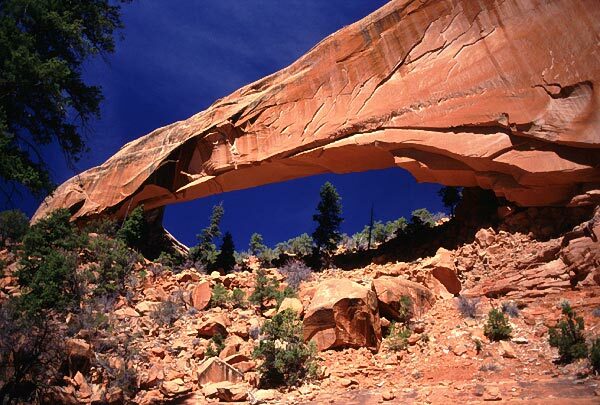 Snake Bridge was first documented in 1988 by the former President of the Natural Arch and Bridge Society, Jay Wilbur. Wilbur wrote an article about the Bridge which appeared in New Mexico Magazine in June 1989. It is surprising that a geologic feature of this magnitude would remain unknown except to a few local Navajos until such a late date. The span of Snake Bridge was measured by Wilbur at 204 feet, and the opening is 61 feet high. 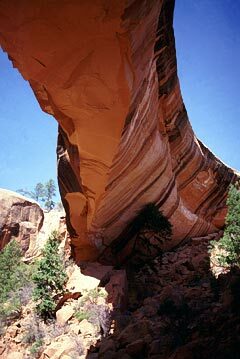 It is located in Sanostee Wash west of Sanostee, New Mexico, and is on the Navajo Reservation. << A close-up from underneath Snake Bridge. Photo by Jay Wilbur. Unfortunately the Navajos have closed Snake Bridge to public access. There is some dispute within NABS about whether Snake Bridge is a meander natural bridge or a shelter arch.